Rt. Hon. 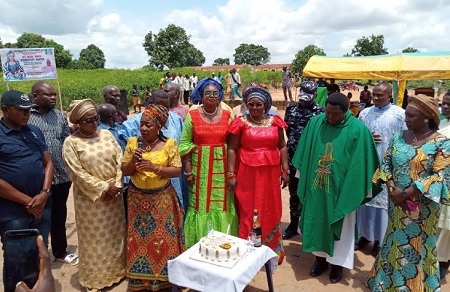 Mrs. Dorothy Mato, the member of the House of Representatives for Vandeikya/Konshisha Federal Constituency of Benue State celebrated her 50th birthday yesterday and a Thanksgiving service was hosted by Sir Sebastian Apaa Mata and the entire Mbawuar community at Immaculate Conception Rectory Kiishi, Mbawuar, Vandeikya Local Government Council of Benue State. In his sermon, Rev. Father Reuben Awaji says when people are celebrating their birthday, they should also be thinking of their death day too and by doing so should always be at peace with God and humanity. He said that those who believe in God should always be in the light of God and should not always expect that life will be rosy. The sermon was brought to an end by saying that challenges help us to do better and achieve greater heights and we should never allow them discourage us from making the desired impact. Rev. Awaji blessed Hon Mato on her 50th birthday celebration and prayed God to give her long life and prosperity which was followed by cutting of cake by Mrs. Mato. The Chairman of the Planning Committee of the occasion, Hon. Tarvershima Ater commended Rep Mato for the significant impact she has made on Mbawuar community. According to him, as far back in 2003, Mbawuar community was in pain due to communal crisis between Mbangur and Mbawuar, Hon. Mato was the first person to visit the community, and donated 10 bags of genuine-corn, clothes and other essential commodities for the welfare of the displaced persons. "When there was sorrow in Mbawuar due to the demise of Mrs. Uja Kyunde living many siblings behind, this our mother, wife, sister and a friend of Mbawuar kindred took a bold step by taking two of the siblings from the husband, fed them, clothed them and sponsored them up to "A" Level now. "Today, more than twenty children from Mbawuar are benefiting from the scholarship Rep Mato gave to Mbawuar sons and daughters. Some of them have obtained their HND, Degrees and school certificates. Mr. Dem Nyikpam Mbashuba HND, Mrs John Agbo Ndere HND, Miss Unom Yange, Degree in view, Mr. Atorough Yiye, now working with Road Safety Commission Abuja and host of others. "The greatest among these philanthropic services is the establishment of School of Health Technology. "Even being in the minority party during her days in Benue State House of Assembly, she remembered the people of Mbawuar by giving two slots of Sure-P to Mbawuar graduates. "She recently donated N150,000 to Immaculate conception Rectory Kiishi, Mbawuar to help fix some things in the Rev Father's residence among others," said Hon Ater. In her speech, Rep. Mato appreciated Sir Sebastian Apaa Mata, the entire Mbawuar community and the Rectory for organizing the event to celebrate her 50th birthday. She appealed to them to continue to give her their unswerving support so that she will be re-elected in 2019 election. She donated N300,000 to the Church to help complete fixing the residence for the Rev father and was supported by other donations from some of the guests.